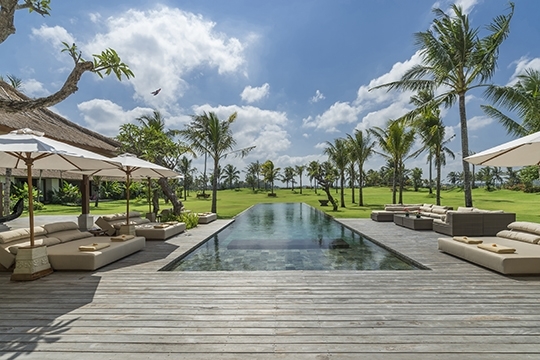 Secluded in a traditional village, a few kilometres inland from Bali’s ‘sunset’ coast, this exceptional, fully staffed, 8-bedroom estate offers abundant living and entertainment space spread over 12,000sqm of land with magnificent rice-field views. Five-star facilities include multiple pools, home cinema, games room, spa, gym, tennis court, car and driver. 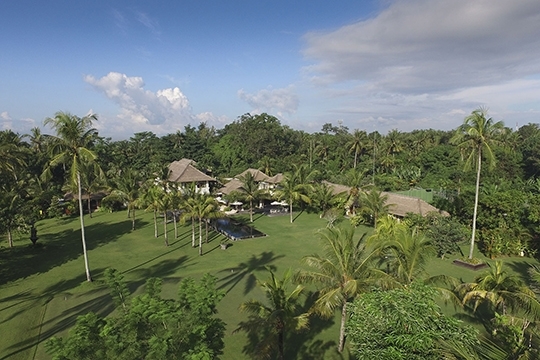 Glimpses of volcanoes and the lush jungle and rice field surrounds of Bali’s Tabanan Regency define The Arsana Estate. 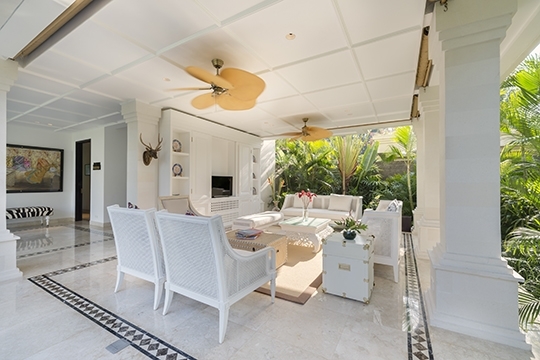 Set in a pretty village, this exceptionally family friendly, 4-bedroomed, Balinese-styled villa literally pours down two hectares of gentle hillside, most fitting for a villa whose name is Sanskrit for 'flow'. Having exponentially raised the bar on the Bali villa experience, Kaba Kaba Estate offers a level of luxury and sophistication that will appeal to the cognoscenti of travellers who appreciate only the finest things in life and wish to enjoy a holiday of extreme privilege with five-star comforts, top-notch services and superb facilities within a sublime rural setting of rice fields and traditional Balinese village life. Resting upon more than a hectare of perfectly kept gardens, surrounded by rural beauty, the eight-bedroom property comprises three residences; each with its own living rooms, terraces and pools, allowing families and friends to retain their privacy, while at the same time all being within easy reach of the main house – the nexus and social hub of the villa. Each air-conditioned bedroom has its own ensuite bathroom and seven have their own TVs and DVD players, while for a family cinematic experience, guests will relish the Moroccan-themed home theatre with projection screen, wide sofas, and a movie system with hundreds of titles available at the flick of a remote. 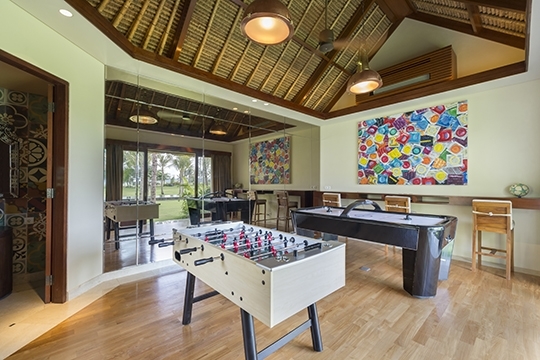 Other facilities provide a long list of fun and relaxation for all ages, including a spa, gym, library, tennis court, games room, croquet lawn, four pools (25m main pool, two plunge pools and a kids wading pool) and endless games and toys. 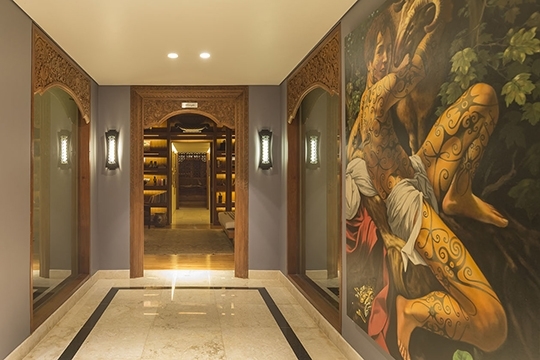 The villa is also home to a wide and eclectic private collection of art and antiques that will dazzle and fascinate both art lovers and novices. With such fabulous grounds, it goes without saying that Kaba Kaba Estate is a wedding venue extraordinaire, with space for up to 200 guests for a sit-down feast on the lawn and a rooftop reception lounge for after-dinner drinks and dancing. 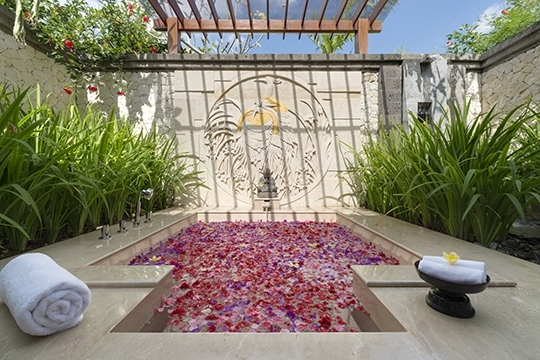 As would be expected at a villa of this calibre, the staff are trained to the highest levels of service and discretion. A five-star chef will make each meal a gourmet experience, and there is a full security team onsite to ensure total privacy and peace of mind. 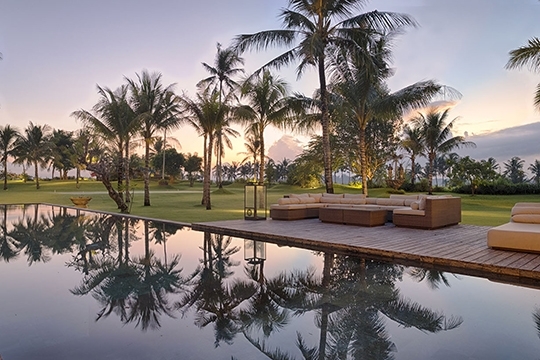 Finally, a car and driver is on hand for those who wish to explore further afield either for sightseeing or for shopping and partying in the bright lights of Seminyak. 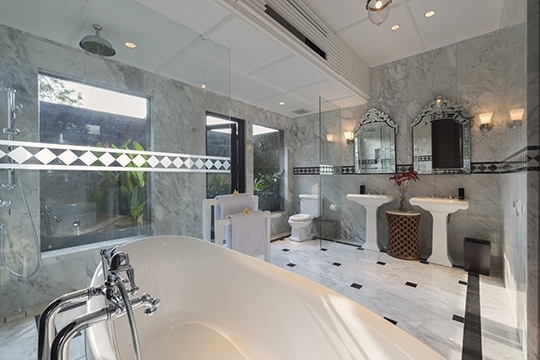 Exquisite 8-bedroom estate loaded with facilities, views and creature comforts. Where do we start? Villa Kaba Kaba satisfies on so many levels and offers so many things to do, see and experience that everything is a highlight. 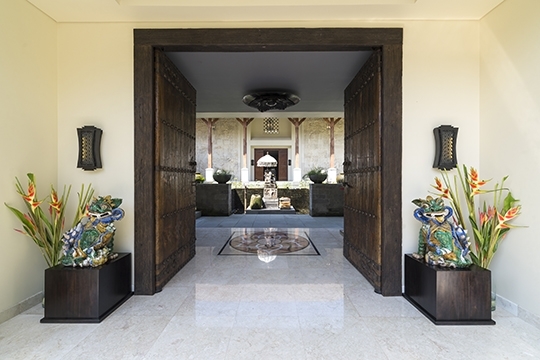 Be sure to take some time to enjoy the estate’s eclectic collection of artworks and antiques, which will delight seasoned art lovers and amaze a whole new generation. And if you are planning to tie the knot, and want to invite lots of relatives and friends. . . well, wedding venues don’t get much get better than this. 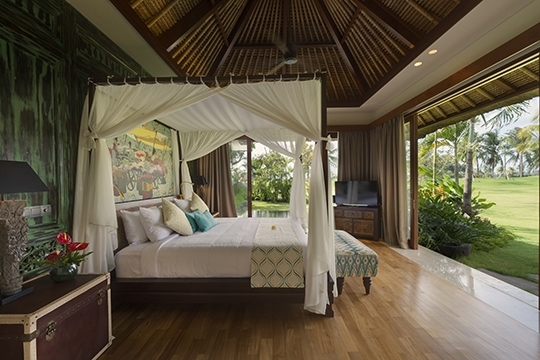 The villa has been meticulously designed and so well thought out that there is virtually nothing wrong with it. One word of warning though, because the place is so big it may not be so easy to keep a track of little ones, and the many ponds and water features around the place will no doubt draw the attention of inquisitive toddlers. 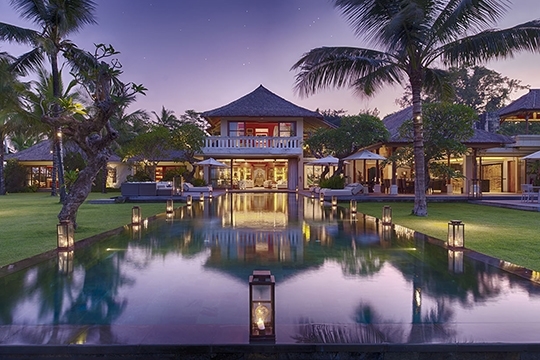 Kaba Kaba Estate lies at the edge of the sleepy village of Kaba Kaba – a stunning example of a traditional Balinese village, and regarded as one of the prettiest on the island. The surrounding rice fields and neighbourhoods are waiting to be discovered, and provide endless opportunities for walking or cycling (bicycles are available for guest use) or for witnessing a ceremony at a local temple (ask the villa manager if your visit coincides with one of these not-to-be-missed events). Just a short drive away is the dramatic cliff-top sea temple at Tanah Lot. 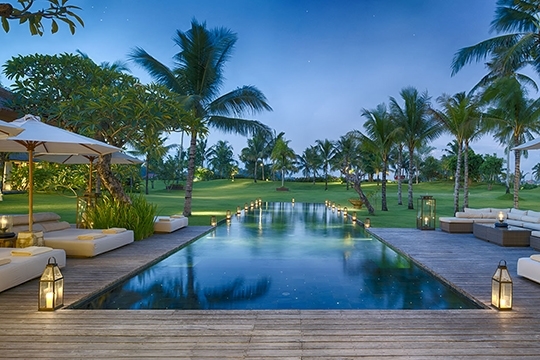 The coastline nearest to Kaba Kaba is rugged and the beaches more suited for walking than swimming, but the surfers’ haunt of Echo Beach, with its smattering of casual waterfront cafés, is fun to visit, as is the delightful Tugu Hotel, just down the beach, while the glamorous boutiques and restaurants of Seminyak are less than half an hour from the villa. Tabanan has a 30-kilometre-long coastline, which presents isolated coves and rocky outcrops and is famous for its surf beaches, including Medewi and Balian, offering the longest point breaks in Bali. (The drawbacks if you’re not a surfer are the sometimes-three-metre-high waves and the undertows). The beaches are sloping and lovely to walk along; covered with black sand which is regarded for its curative, therapeutic properties and especially helpful for arthritis. 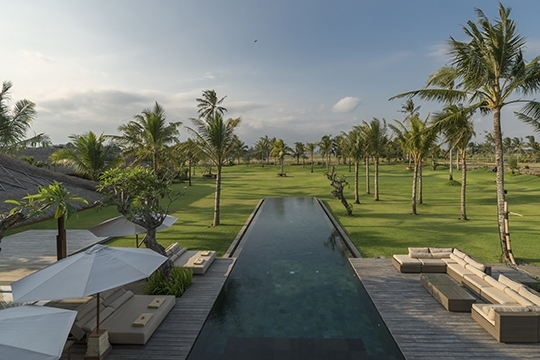 The Regency is known as Bali’s ‘rice bowl’ – the most agriculturally productive region on the island, with rice fields stretching from the coast to as high as 700 metres above sea level, where the terraces are reminiscent of amphitheatres. Besides rice, there are crops of coconuts, coffee, cacao, spices and tropical fruits. This area is also home to Mount Batukau (2276m), the higher slopes of which are alpine, with mountain streams, ferns, wildflowers, creepers and orchids, as well as the rare, black, leaf-eating monkey, the kijang (small forest deer), large butterflies and moths, flying lizards, the landak (porcupine) and the lubak (mongoose). 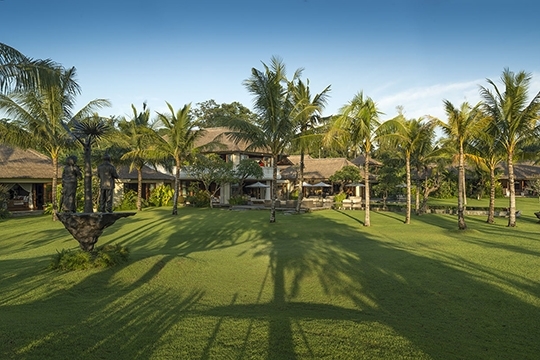 It is also a bird watchers’ paradise, habitat of the Bali black eagle. 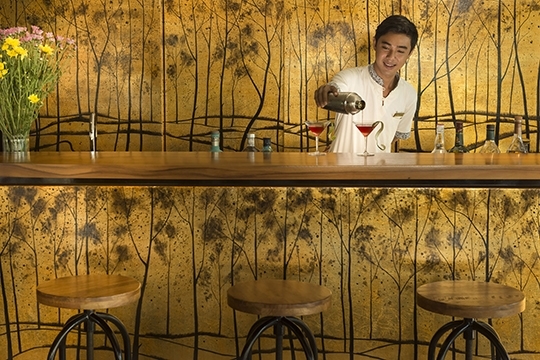 There are no western-style shops or bars in this area, and restaurants serving international cuisine are few and far between, mainly adjoined to the region’s limited number of small and remote hotels. 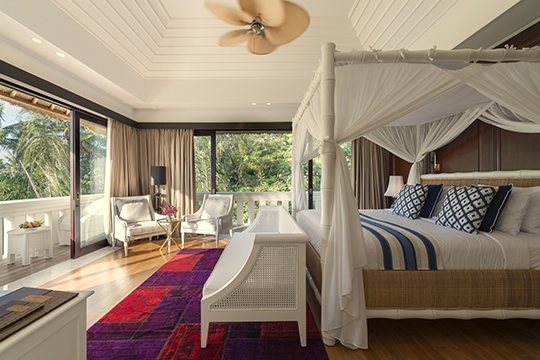 The eight air-conditioned bedrooms at Kaba Kaba are generously arranged between a two-storey main pavilion, a two-storey colonial guest pavilion and a single-storey garden guest pavilion. With the exception of the kids’ room, each has a walk-in dressing room, a TV/DVD player, and a furnished terrace or balcony. Seven of the bedrooms have king-size beds (two of which can be converted to twins), while the kids’ bedroom offers two sets of bunk beds. 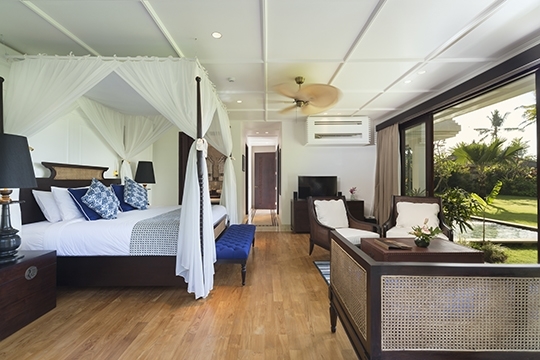 Each bedroom has an ensuite bathroom fitted with a rain shower and bathtub (shower only in the kids room). 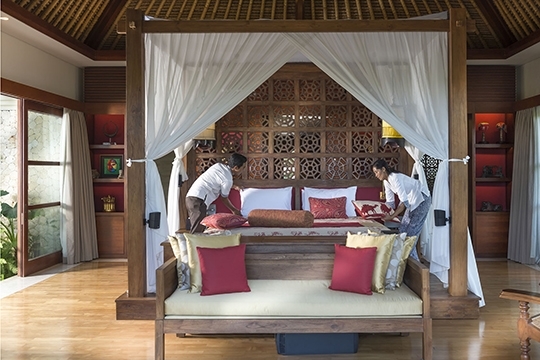 The grand master suite in the main pavilion is adjoined by a cosy air-conditioned library, which is also accessible from the garden. The bright, elegant, formal living room in the main pavilion opens widely to the pool deck offering a semi-open-air experience or air-conditioned comfort. 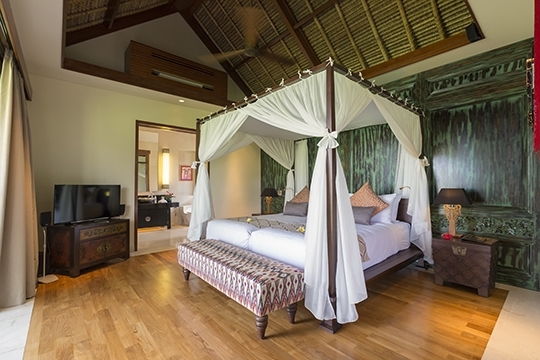 The other two living rooms (one in each guesthouse) are open-sided and cooled by ceiling fans. Positioned next to the pool deck is the dining pavilion, adorned with fascinating antiques and with 18 chairs arranged around a six-metre-long, solid wood table under a soaring roof. On one side is a guest feature kitchen with a service bar and counter. A professional service kitchen is situated behind. The Moroccan-themed home cinema – where velvet drapes hug burgundy walls and an L-shaped sofa can seat an audience of 12 – offers a huge pull-down projector screen, a 60-inch satellite-channel TV and a large collection of on-demand titles. A games room is well stocked with air hockey and foosball tables, Xbox, PlayStation and Nintendo, as well as board games. 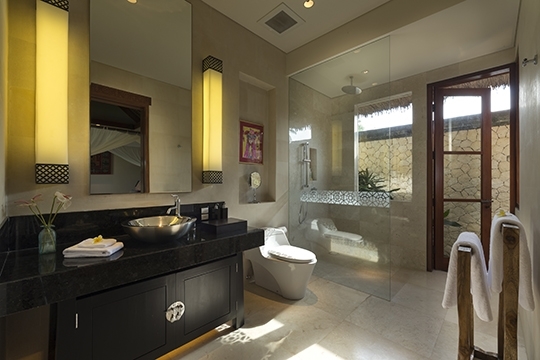 It also has its own bathroom and a small bar area. 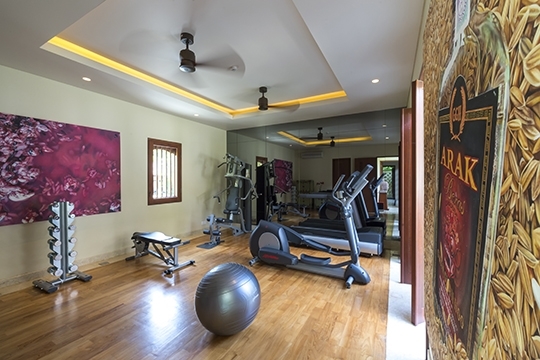 Additionally, the villa features a well-equipped gym and a professional spa offering all manner of pampering treatments. Above the spa and gym is a large rooftop terrace with couches and a bar located under the cover of an open-sided gazebo. 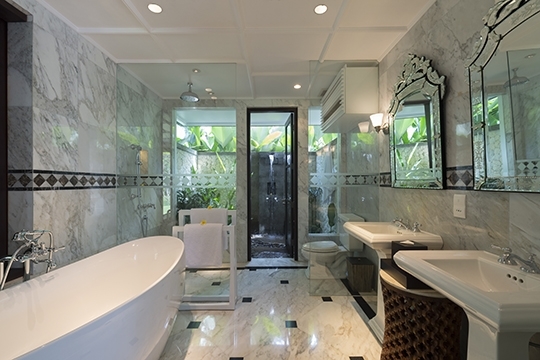 Kaba Kaba’s gorgeous garden presents rolling velvety lawns, lily ponds, a duck pond, croquet lawn, tennis court, and 25m swimming pool bordered by a broad timber sun deck furnished with loungers and umbrellas, all of which is surrounded by spectacular rice-field views. Discounts are sometimes available for booking early (usually 6 months), long stays (usually 14 or 30 days), or last minute bookings (usually 7 days). For discounted rates click on the Check Availability button and enter your dates or contact Customer Service. 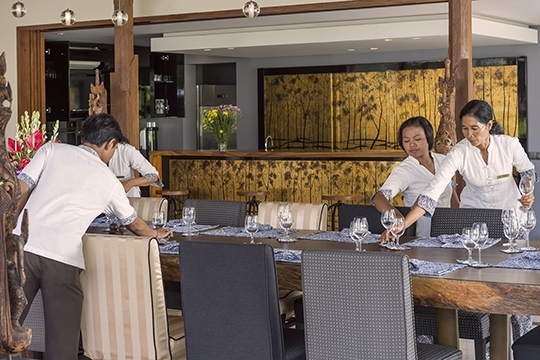 An eco lodge situated in a forest 15km up Mt Batukau, this is truly a nature lover’s paradise and this simple restaurant does healthy home-cooked food. Offers a range of vases, bowls, teapots, soapdishes and candle holders in greenish glaze are embellished with frogs, dragonflies and leaves. Simple place serving Indonesian dishes amid stunning rice terraces. A beautiful location, Balian Beach is a great surf spot on the southwest coast with several small restaurants and simple accommdodations aimed mainly at surfers..
Medewi Beach is a beautiful rocky beach located in west part of Bali Island and appointed as one of the best surfing points in Bali. Offering a contemporary spin on ancient Asian healing techniques, and age-old beauty recipes that feature the curative benefits of fresh, natural, quality ingredients. 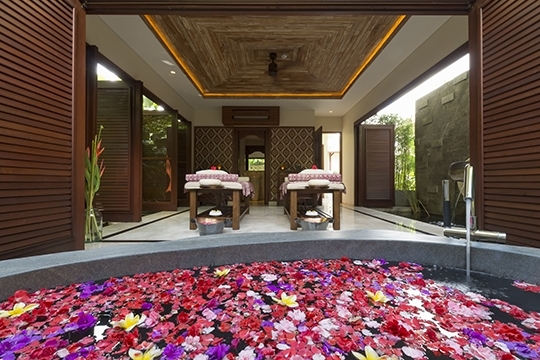 Indulge mind and body in a heartfelt and surprisingly different Bali luxury spa experience. Beach rides are offered here, including an opportunity to swim with the horses. 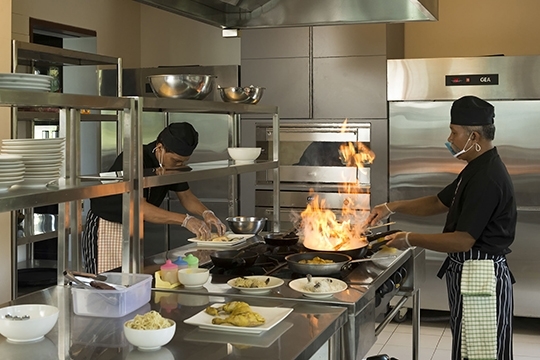 Hotel set in rural Bali with cooking school and restaurant serving Asian and Western food using organically grown ingredients. American couple Blair and Ben Ripple, who run this large organic farm, feature the torchlit Firefly Supper Series from May–Oct: seasonal produce almost straight from their fields to your plate. 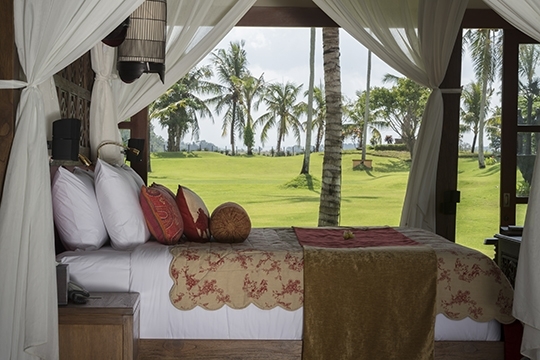 Located in a resort the restauran has magnificent rice field and mountain views, the food plays second fiddle to the environment but still, expect very decent Indonesian and Western fare. Situated 7km from Tabanan town, this is a small butterfly research and education centre where you can get up close and personal with a number of spectacular species, which flutter in an enclosed area; they are more active on warm, dry days. Dedicated to the cultivation of rice, the mainstay of Tabanan’s economy, this museum has well documented displays of agricultural tools that trace the history and process of rice from paddy field to kitchen. 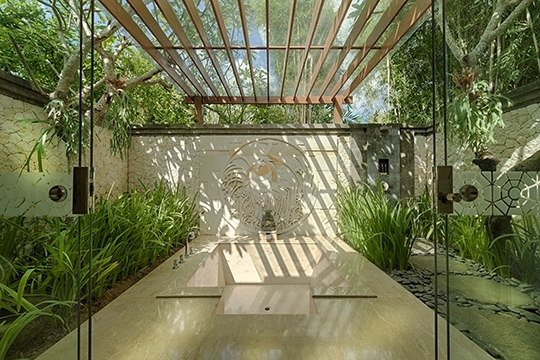 Ask to see the adjacent traditional Balinese house with a lumbug (rice storehouse). 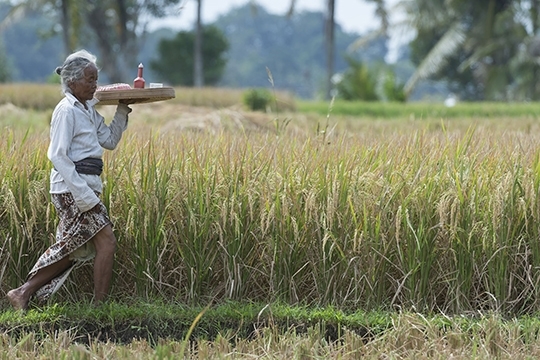 A Unesco World Heritage Site for its preservation of traditional Balinese farming techniques. True to its name, which means extraordinary or truly marvellous, this scenic point at 850 metres (2,700ft) above sea level offers one of the most breathtaking panoramic views imaginable, with rice terraces stretching all the way to southern Bali. Padi Bali (indigenous Balinese rice) with long graceful stalks is grown here. the 2276m Mt Batukau is the island’s second highest peak, and the area around this mountain boasts the greatest biological diversity in Bali. Here, local guides lead visitors on anything from gentle hikes through the food forests and jungle, to challenging treks. Pura Luhur Batukau, the stone coconut temple near the peak of Mt Batukau, (accessible by car), venerates the deities of mountains and lakes. 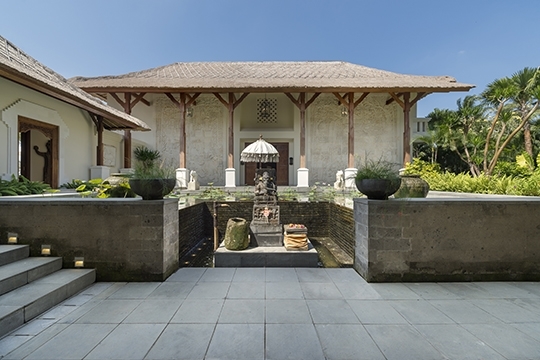 Here, a branch of the Tabanan royal family owns the atmospheric 17th-century Puri Anyar (New Palace) and Puri Agung (Great Palace), both with beautiful architecture and ambience of the past. This beautiful and desolate dark sand beach is totally devoid of tourists. The currents make it unsafe for swimming, but where the river empties into the sea to the east there is a safe and refreshing spot where you can swim. The scenery is beautiful in this peaceful village, where rice farming, fishing and sea salt harvesting are the main activities. 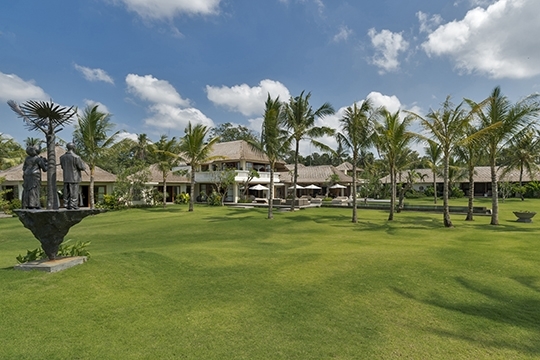 8 bedroom villa located in Tabanan, Bali. Ideal for Body and soul, Bring the relatives, Kid friendly, Gastronomic delights, Going for golf, Fair share for groups, The great outdoors, Party pads, Spa sensation, Sensible for seniors, Room with a view, Walk into town, Perfect for weddings. 9 out of 10 based on 15 user reviews.